Donna is a long-time paddler. Originally, she started by whitewater kayaking, then got over it. :0 Now she takes every opportunity to go sea kayaking, canoeing and paddleboarding (SUP). Paddle Canada Sea Kayak Instructor. Donna manages all of the office functions of Undercurrents. As an avid user of paddling gear, she will readily give her experience-based opinion of a product. If you can catch her on the showroom floor. 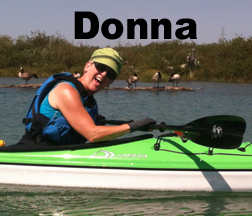 Donna started Undercurrents with her husband, Tony, whom she met paddling! She is acknowledged by those in the know, as the brains of the operation!